The CleanFinancial.com guide to Nikkei 225 spread betting. Where Can I Spread Bet on the Nikkei 225? Where Can I Trade the Nikkei 225 for Free? Where Can I Practice Trading the Nikkei 225? How to Spread Bet on the Nikkei 225? Clean Financial readers should note that you may also be able to financial spread bet on the Nikkei 225 via other platforms. The latest COT Report (Commitments of Traders) for the Nikkei 225 futures market has been released by the CFTC, please see our Nikkei 225 COT report below. Where Can I Find Live Prices and Charts for the Nikkei 225? We show readers some pretty accurate Nikkei 225 spread betting prices - see above. The live CFD chart below also provides you with a good overview of the Japanese stock market. The chart above is provided by Plus500 and is typically based on the Nikkei 225 futures price. Should you want to look at real-time spread betting charts and prices for the Nikkei 225, you will normally require a spread betting account. A spreads account would also let you access the shorter-term spot markets. Note that such accounts are subject to suitability, credit and status checks. Should your account application be accepted then, when you log on, you will be able to analyse the charts and the current pricing. On most platforms, these will be free. If you were to trade then, before starting, remember that spread trading and CFD trading involve a significant level of risk to your funds and it's possible to lose more than your initial investment. A range of intervals e.g. 2 minutes, 5 minutes, 10 minutes, 30 minutes, 2 hours, 4 hours etc. Useful chart overlays e.g. Ichimoku Kinko Hyo Clouds, MAs, EMAs, Bollinger Bands, Envelopes, Linear Regression etc. A choice of indicators e.g. Momentum Percentage, Williams %R, Chaikin Volatility, Volume Index, Klinger Oscillator etc. If you want to spread bet, or trade CFDs, on individual Japanese shares then CMC Markets is a good starting point. In the past IG offered a number of Japanese stocks but they don’t seem to be on the IG site anymore. Likewise, most of the other reputable firms have a good offering when it comes to UK, Eurozone and US shares but they fall down when it comes to Japanese stocks. Advert: Nikkei 225 Spread Betting, sponsored by FinancialSpreads.com. You can spread bet on the Nikkei 225 with Financial Spreads. Where Can I Spread Bet on the Nikkei 225 for Free? Trading the stock market is not without risk. Having said that, if you want to open a free Practice Account, that lets you trial spread betting, then please see below for more details. When considering which trading option is right for you, don't forget that in the UK, financial spread betting is currently tax free*, i.e. it is exempt from income tax, stamp duty and capital gains tax. Each of these spread betting companies offer a risk free Practice Account that lets investors practice with a range of trading orders and test new ideas. As with a lot of markets, you can speculate on stock market indices, such as the Nikkei 225, to go up or down. Whilst spread betting on the Nikkei 225 index you trade in £x per point, where a point is one point of the index itself. Therefore, if you risked £4 per point and the Nikkei 225 moves 21 points then that would make a difference to your profit/loss of £84. £4 per point x 21 points = £84. This is a Rolling Daily Market and so, unlike a normal futures market, there is no settlement date. If your position is still open at the end of the day, it just rolls over into the next session. Then you might go long of the market at 8828 for a stake of £2 per point. With this spread bet you make a profit of £2 for every point that the Nikkei 225 index pushes above 8828. Having said that, this trade also means that you will make a loss of £2 for every point that the Nikkei 225 market moves below 8828. Thinking of this in a slightly different way, if you buy a spread bet then your profits (or losses) are found by taking the difference between the final price of the market and the price you bought the market at. You then multiply that difference in price by your stake. With this in mind, if after a few days the Japanese stock market started to move up then you could choose to close your trade so that you can lock in your profit. Speculating on the Japanese stock market, whether by spread betting or otherwise, doesn't always lead to a profit. With the above, you wanted the index to increase. However, the stock market can fall. If the Nikkei 225 had fallen then you could close your trade in order to restrict your losses. Note: Nikkei 225 Rolling Daily index market accurate as of 15-Nov-12. Whilst financial spread betting on the Japan 225 index you trade in £x per point. As a result, if you staked £2 per point and the Japan 225 moves 37 points then that would make a difference to your bottom line of £74. £2 per point x 37 points = £74. Then you might decide that you want to go long of the market at 8870 for a stake of, let’s say, £3 per point. So, you gain £3 for every point that the Japan 225 index increases above 8870. Having said that, you will lose £3 for every point that the Japan 225 market goes below 8870. Looked at another way, if you were to ‘Buy’ a spread bet then your P&L is found by taking the difference between the final price of the market and the price you bought the spread at. You then multiply that price difference by your stake. With this in mind, if after a few sessions the Japanese stock market moved higher then you could consider closing your spread bet so that you can secure your profit. Speculating on stock market indices is not always easy. In this case, you had bet that the index would go up. Of course, the Japanese index could fall. If the Japan 225 index had started to fall then you could choose to close your position to stop any further losses. Note: Japan 225 Rolling Daily spread betting price taken as of 19-Oct-12. The above is the 'Nikkei 225 Index yen denominated COT report' which is different from the 'Nikkei 225 Index dollar denominated COT report'. For the dollar denominated report see Nikkei 225 COT (USD Denom). 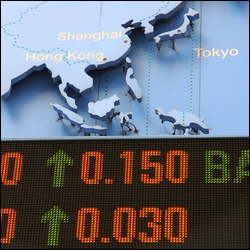 The Nikkei 225 refers to the price-weighted average of 225 stocks of the first section of the Tokyo Stock Exchange. For more details visit the official Nikkei Website: http://www.tse.or.jp/english/. 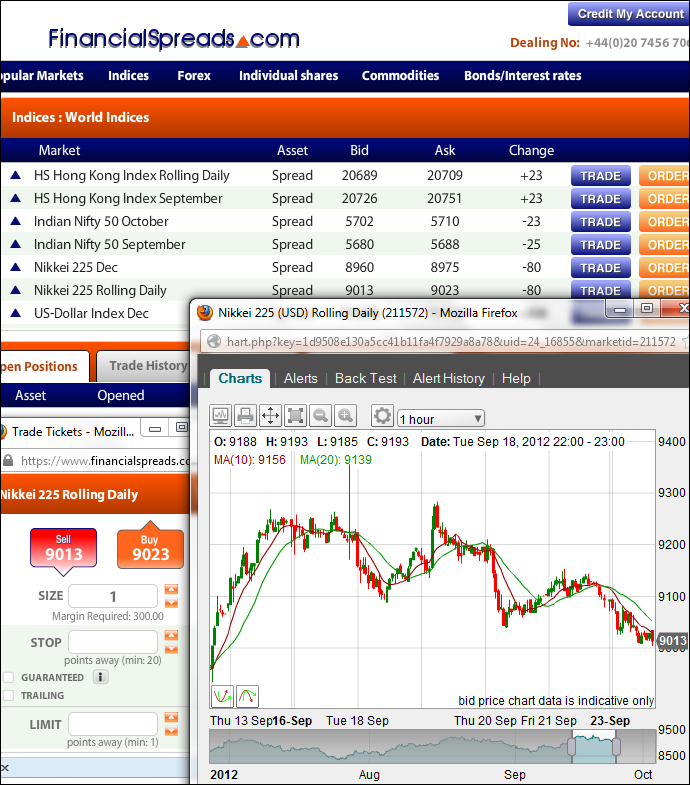 Nikkei 225 financial spread betting guide with daily analysis. Plus live Nikkei 225 charts & prices, where to spread bet on the stock market index commission-free and tax-free* as well as... » read from top.